One more post about the poisonous atmosphere in Britain where Israel is concerned. While Binyamin Netanyahu was in London for the Balfour centenary celebrations, thousands of ill-wishers took to the streets to protest. What were they protesting? Anything from Israel’s presence in Judea and Samaria to Britain’s responsibility for the establishment of the State of Israel via the Balfour Declaration, through to opposing the very existence of Israel. 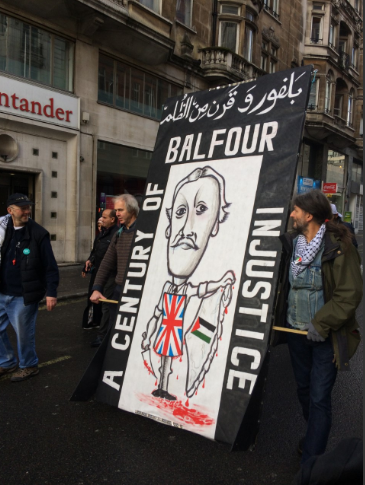 Several thousand pro-Palestinians marched through the streets of London on Saturday to protest the centenary of the historic Balfour Declaration that helped lead to the creation of the Jewish state and to denounce Israel. The marchers held signs reading “Free Palestine” and Justice for Palestine,” while they chanted “Free, Free Palestine” and “Occupation no more.” There were several ultra-Orthodox Jews spotted marching in the crowd, presumably from extremist anti-Zionist sects. Israeli TV reports said there were some 3,000 marchers, and that two hours after the protests started, several hundred pro-Israel counter-protesters arrived and waved Israeli flags nearby. That moment when Zionists took the lead of the anti-Balfour, anti-Israel march in Oxford Street, London today and headed off hate. The PSC Twitter feed absurdly suggested 15,000 marched, yet only 2300-2600 walked passed Hanover Square. There may have been a few hundred waiting at Westminster for the speeches, but my head-count for the march itself is supported by full video evidence. The organisers and police had expected about 10,000, so whichever way the organisers wish to spin this, the turn-out was more than disappointing for them. In the end, they thinned the demonstration into groups like a carnival procession, placing a minute or two between them, to make it look far bigger than it was. Worse still for the organisers, as the procession approached Harewood Place, a group of pro-Israeli counter-demonstrators entered Oxford Street to take up their place at the front of the march. An effective example of guerilla activism that thoroughly annoyed the anti-Israel crowd. From that point on, the first thing anyone saw of the demonstration, was the waving Israeli flags. At least three of the speakers at the static event at the end of the march, negatively referenced the actions of the pro-Israeli crowd, a good indicator of the ‘annoyance’ the activity created. In total, there were about 70-80 pro-Israeli counter-demonstrators present. At the recent Labour Party conference, in discussions I had with both ‘free Syria’ and ‘free Iran’ groups, it became obvious that Labour party activism is being suffocated by the Palestinian cause. Groups supporting real democratic change in the Middle East are not having their voice heard. If you stand with the Palestinians, you will find yourself in opposition (or left to ignore) most of the real humanitarian causes in the region. Iran, Hamas, Hezbollah become ‘friends’. So for a moment, we should forget the several hundred hard-core antisemites that walked the streets of London. We need to ask why it is that those people are being supported by British unions, including Unite the Union, UNISON, NUT, GMB, ASLEF, RMT, FBU, UCU & CWU. There is a knowledge within this small group of Zionists, that is not possessed by most of British society, and certainly not by most mainstream British Jewish organisations. These people see and face down real anti-Jewish hatred on our streets. They see the extremism in the eyes of the opposition, and they know this is a danger that cannot be ignored. On occasions they communicate with anti-Israel activists present, and become aware of the level of ignorance fueling the hate in some of the opposition. And they witness the absurd marriage between the radical left and Islamist positions in horror. The more they see of it, the more they understand it has to be challenged. David Collier’s words are a warning and a recommendation for pro-Israel activists to be much more pro-active on the social and mainstream media in order to counteract the floods of hatred that swamp the media. As a side-event to the Balfour celebrations, Netanyahu was interviewed on the BBC by veteran reporter Andrew Marr. As the Campaign Against Antisemitism notes, Marr appeared to blame Israel for the rising antisemitism in Britain, as well as other snide digs at Israel. But Netanyahu did not lose his cool, and put the interviewer straight. Mr Netanyahu correctly answered: “Well, you know, I wouldn’t blame Jews for antisemitism any more than I would blame blacks for racial hatred stirred against them, or anti-gay hatred. It’s because of what they are.” Mr Netanyahu appeared to have more to say, but Mr Marr interjected: “There’s a distinction between Jews and policies.” Mr Marr was correct to draw such a distinction, which makes his suggestion that many Jews think that rising antisemitism in Britain has been fuelled by the political positions adopted by the Israeli government so extremely clumsy. It is disappointing and concerning that an experienced broadcaster like Mr Marr, who was the editor of The Independent and then the BBC’s political editor, should see fit to conflate criticism of Israeli policies, which is not antisemitic, with rising antisemitic crime. Marr appeared to warm up as Netanyahu mentioned the close intelligence and security ties between Israel and Britain.
. Watch how he calmly copes with the usual boiler-plate prejudices about the Palestinians and then makes the points that so badly need to be made to a British audience – such as pointing out that Israel has helped save many British lives. Not a fact that the British often hear. We can all learn from Binyamin Netanyahu’s cool demeanour and immediate grasp of the facts as well as his ability to eloquently present Israel’s case. 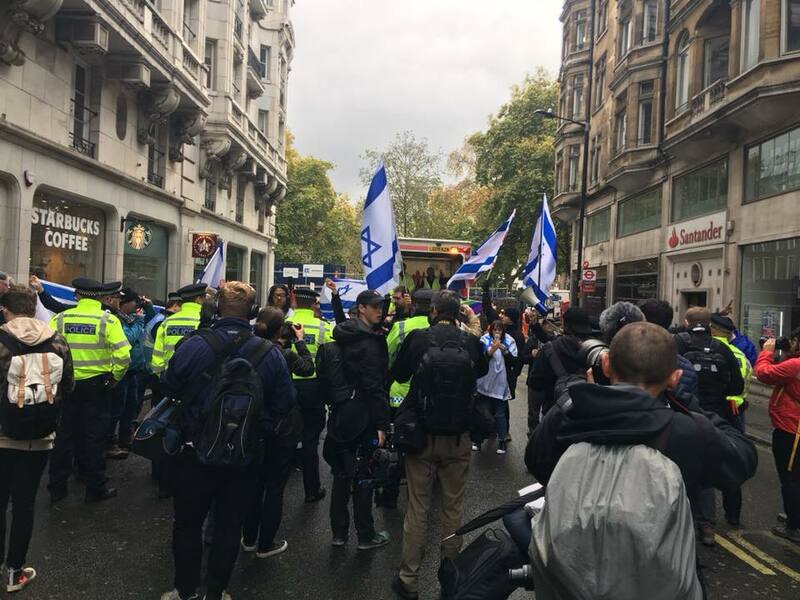 We can also learn from the example of the Zionist Federation and the Sussex Friends of Israel who organized the counter-march against the PSC and their cohorts, making an anti-Israel demo look like a pro-Israel rally. Kol hakavod to all of them who participated, many of whom take part in counter-demonstrations every week around Britain. This entry was posted in Antisemitism, History and tagged #Balfour100, anti-Zionism, antisemitism, BBC, Binyamin Netanyahu, Britain, David Collier, Israel-Palestinians, PSC, Sussex Friends of Israel, Syrian refugees, trade unions, Zionist Federation. Bookmark the permalink. Again, as always, thank you Anne for this important information about the infamy infecting England and Europe, the danger to Israel, and our need to remain ever vigilant.